Armed with missiles and other military weapons, pirates take control of the high seas, ravaging ships and killing off their crews in the process. They're on the brink of becoming unstoppable-unless Mack Bolan can put an end to their pillaging. Using a cargo freighter as bait, Bolan attempts to lure the pirates into an attack. But when his plan backfires, he learns the leader of the group is more than a worthy opponent. He's not only tactical in his planning, but a skilled fighter in multiple disciplines. And his influence reaches deep into one of Europe's most notorious crime families. 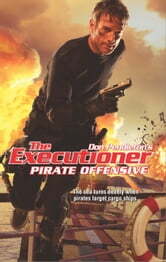 Bolan will need more than just his sea legs to seek and destroy the pirate fleet and its brutal, calculating commander. The open ocean is a war zone, and the Executioner isn't taking prisoners.